Day Three – I’m sort of shocked that I haven’t cheated even once. Temptations are everywhere. I leave the house later than usual so I have no time to cruise over to Starbucks and blow the challenge. 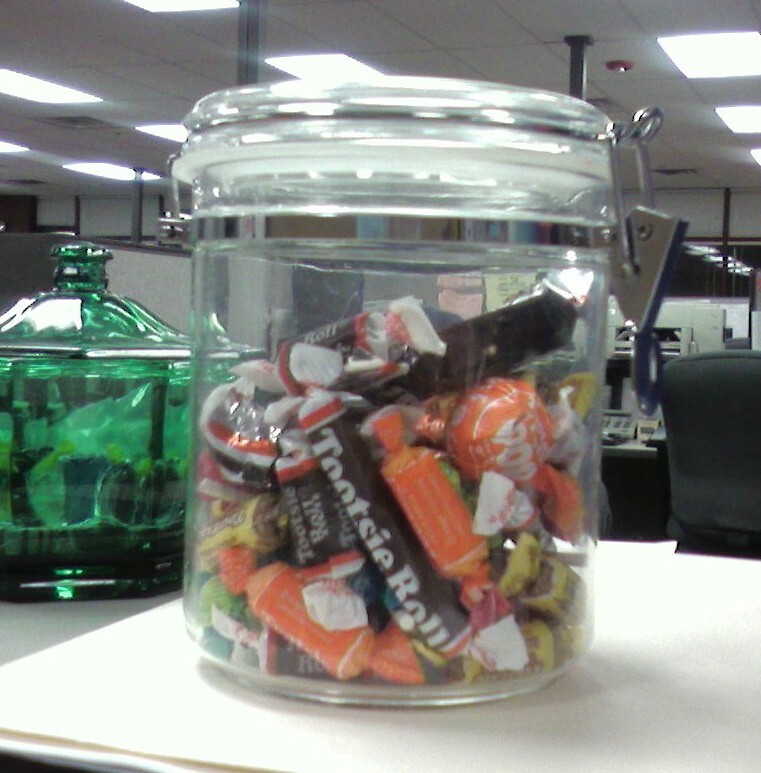 The community candy jar at work is stationed right at my eye level and filled with Tootsie Rolls and Tootsie Pops. It’s taunting me. Thankfully the Costco keg of Red Vines that usually sits beside it has been emptied for the week. No one I know is trying to change their eating habits so I am on my own. It's nothing new - I've been making lifestyle changes for a year while hubby lives on sausage and cheese. C'est la vie. I can't twist his arm. Tonight was typical for me. For a half hour I listened to a coworker moan and groan about her “diet.” Translation – she hasn’t eaten fast food since her dinner break last night. She finally succumbed to the call of the vending machine and I thought that would be the end of it. But noooooo. She started rhapsodizing about her Baby Ruth bar as if it were the most expensive Swiss chocolate in the world. I fought the urge to throw something at her, and then I felt bad when she actually choked on the damn thing. Wow. Food karma is a b*tch. Temptations and the lack of support are tough but when it comes to eating heart healthy, time management is probably the biggest hurdle for me. Odd hours at work leave little time to prepare meals so I handle most everything on my days off. For items that don't freeze well I fit in preparation when I can. It's not usual for me to be outside grilling chicken and vegetables at 8am or baking bread at midnight. Thanks to the challenge I can't be a slacker and stop for fast food on the way to work so I've got to find the time to prepare everything I need. It's going to be tough, but exciting too. During my meal planning I started to make a mental list of the convenience foods I’ll need to replace in my diet, like bottled barbecue sauce. I cannot find a recipe for barbecue sauce (that I’d eat) which doesn’t include items like ketchup and soy sauce. It looks like I’ll be playing with tomatoes and spices on my day off. For the last three days breakfast was oatmeal with fruit or an omelet made with local eggs from the Downtown Mesa Farmers Market . Lunch was a sandwich with chicken breast, lettuce, tomato, and cucumber. The bread is on my own multi grain and I pack a tiny container of home made mayo with my little blue gel freezy thing. My lunch bag gets packed with plenty of fruit for snacking. The goal for this week is to try some new recipes with honey since sugar is off my ingredient list until November. Wish me luck!